Under the direction of Coach Nicole Stiles - Fall Cats is for girls who want to train on Sundays and get an edge on their competition. Carolina Cats fall training is one day per week on Sundays for 90 minutes each with excellent coaching designed to improve individual skills and team concepts. 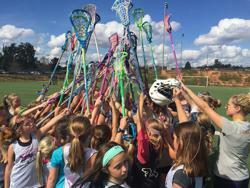 The first half of each session includes quality instruction and skill development, and the second part is a chance to sharpen those skills in lacrosse games versus players in your division (if and when the players are ready for game-like situations). The academy is appropriate for the beginner as well as the experienced player. Girls are grouped by age and then again by experience. Water is not provided at the fields and every player is responsible for bringing enough water or sports drink to hydrate during the academy. COST $295.00 per player (plus applicable credit card fees). Includes six dates of expert instruction from some of the areas best coaches as well as current and former collegiate players. Players also receive a Carolina Cats reversible jersey, and a Carolina Cats t-shirt. CANCELLATION & CHANGES All cancellations and changes to the schedule (due to severe weather) will be posted UNDER DAILY SCHEDULE & LATEST NEWS ONLINE HERE. The site will be updated 45 minutes before your scheduled start time. Please get in the habit of checking the site before you depart for the field.